Bio-Trauma 911, Inc. will always provide a written estimate of the work to be done with an estimate of the overall costs. While this seems to be a common sense approach, many companies will simply tell you that there is no way to estimate the cost of the job and will assure you the final cost will be "reasonable". Only after you've signed a contract and all of the work has been completed will you discover that the total cost incurred by you and your insurance company is much more than it should have been. Our staff is routinely called upon to complete price comparisons for businesses and agencies who feel that they have been overcharged for services provided by other remediation companies. Our staff is here to assist you. If you have not yet contacted us, please do so before signing a contract with any other company. Even if you decide against using our services, our knowledgeable staff can still help you to negotiate a fair price for the job at hand. Call our toll free number at 1-800-759-6960 and ask for Martha Lenz or Steve Hanna. You will never be charged for asking for our advice. Since 1995, the caring and compassionate staff of Bio-Trauma 911, Inc. has been insturmental in helping hundreds of hoarders throughout the Midwestern United States. 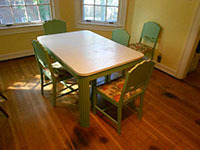 With a trained and knowledgeable staff of technicians in the State of Ohio, Bio-Trauma 911 can offer you or your family member(s) professional and cost effective hoarding cleanup services in Columbus. 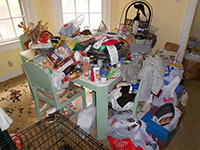 Our hoarding and clutter cleaning services are offered to residents in and around the following cities: Columbus, Cleveland, Columbus, Toledo, Akron, Dayton, Parma, Canton, Youngstown, Lorain, Hamilton, Springfield, Kettering, Elyria, Lakewood, Cuyahoga Falls, Euclid, Middletown, Mansfield and Newark. Please feel free to call us at 1-800-759-6960 to see if we service your area. Bio-Trauma 911, Inc. opened its doors in 2005. Since that time our staff has continued to refine, redevelop and improve the heartfelt and compassionate services we offer to families, friends and loved ones of those injured or deceased. The praise and thanks given to the staff of Bio-Trauma 911, Inc. is a true indicator of our continued success as a Columbus crime scene cleanup company. Whether you're faced with cleaning the remains of a traumatic death, a suicide or accident scene, our staff is here for you. If you have a family member or friend in need of help because of a gross filth or hoarding problem, our staff is here for you. If you just need to talk, our staff is here for you.